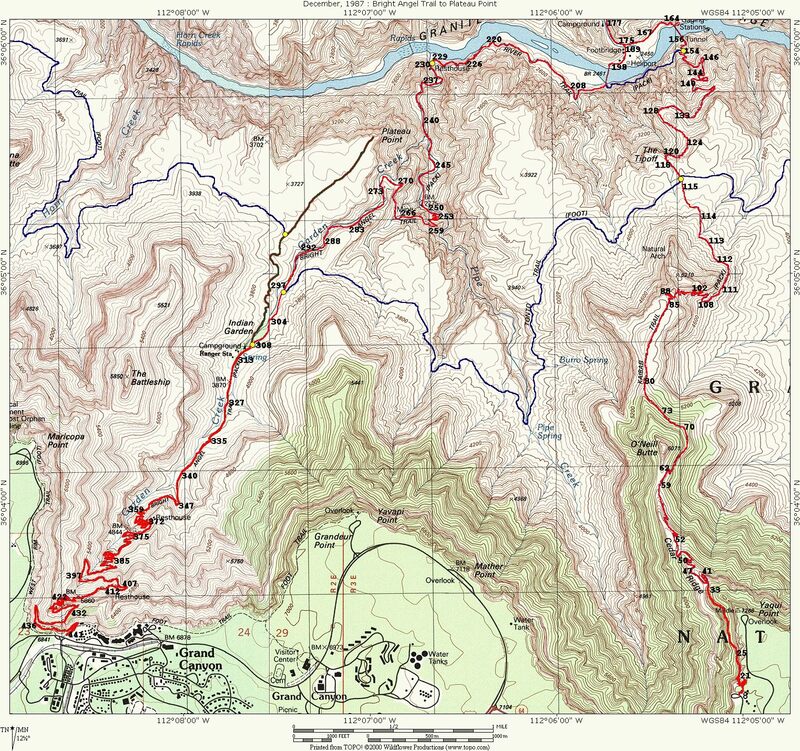 The map at the left shows the detailed view of the last part of the virtual hike with the pictures numbered. Most of these locations are fairly accurate, but there are some that I must admit are just "best guesses." 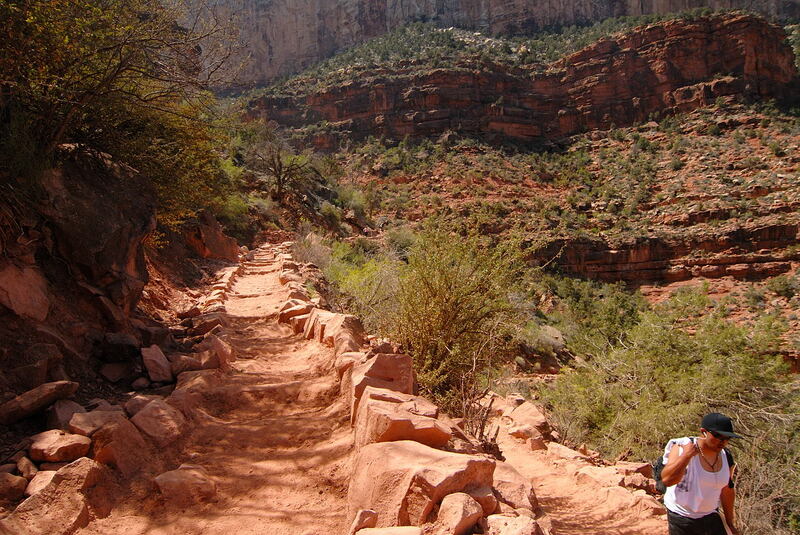 I hope you've been eating and hydrating because the real "fun" is about to begin. (Yes, this is the new definition of "fun" we've just learned.) 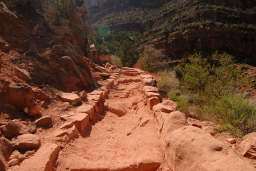 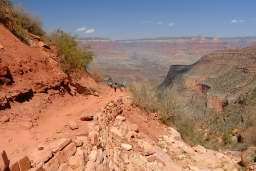 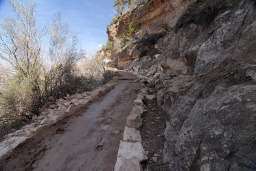 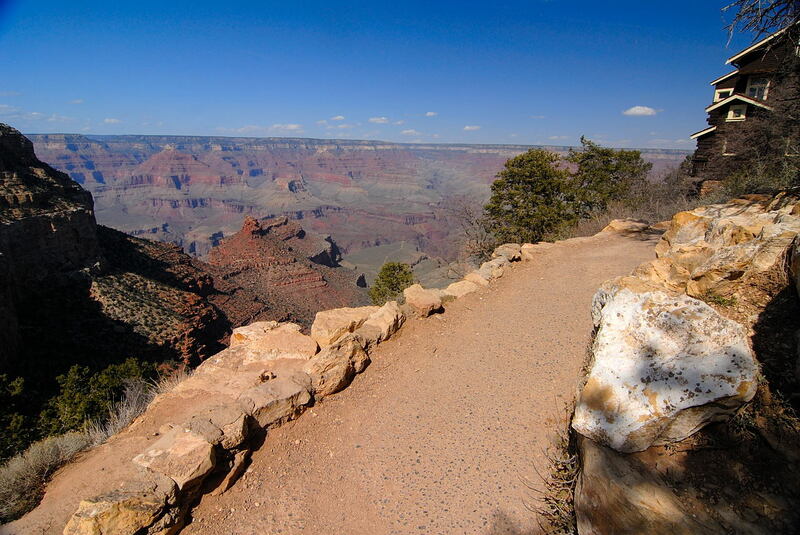 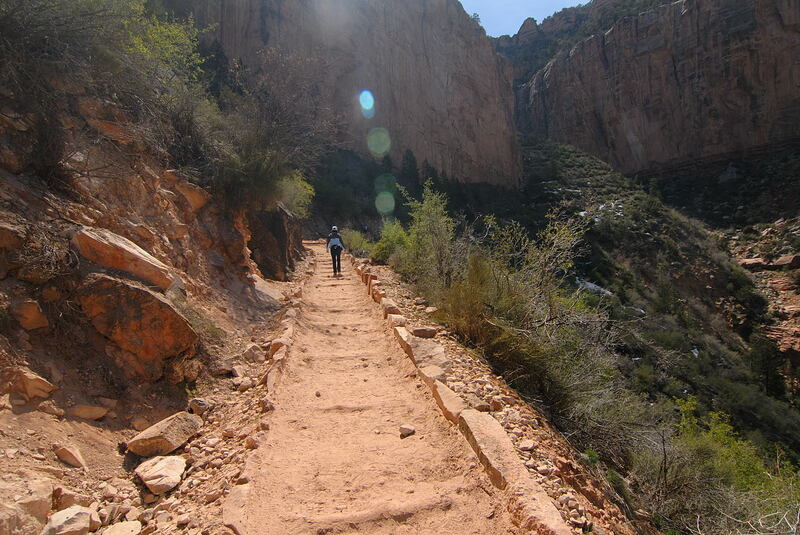 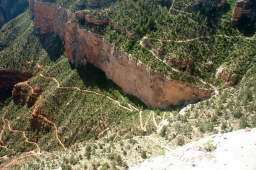 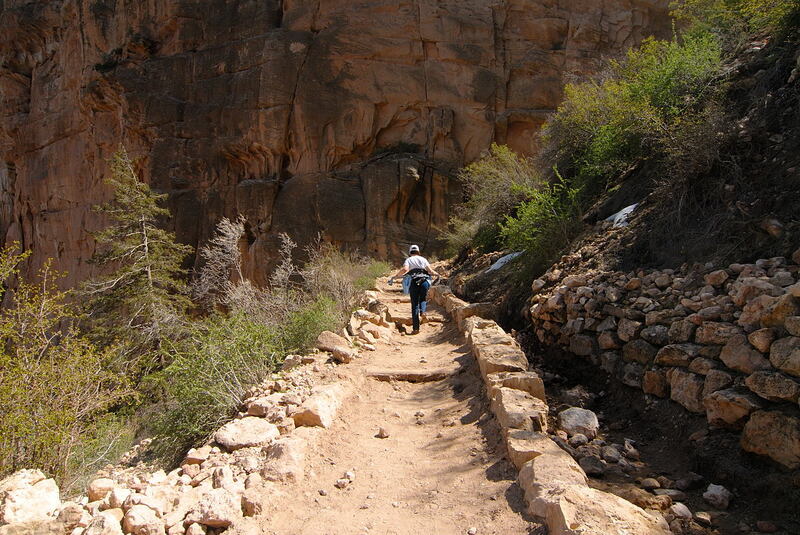 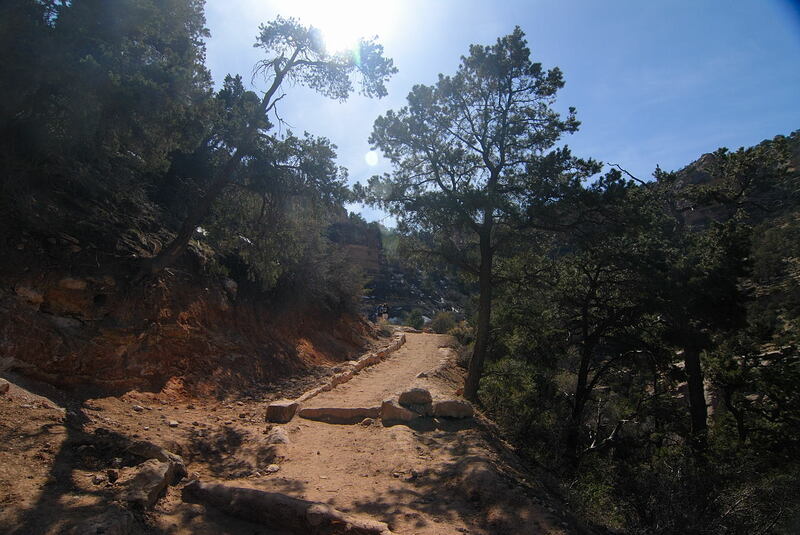 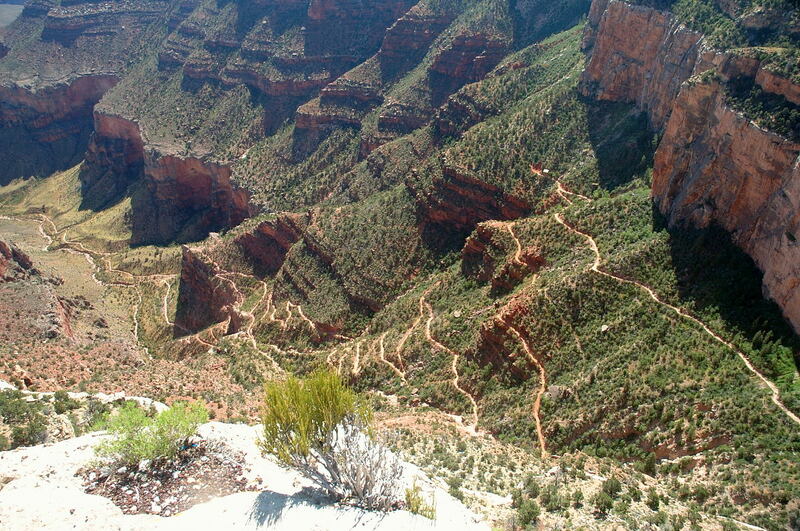 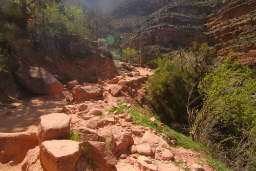 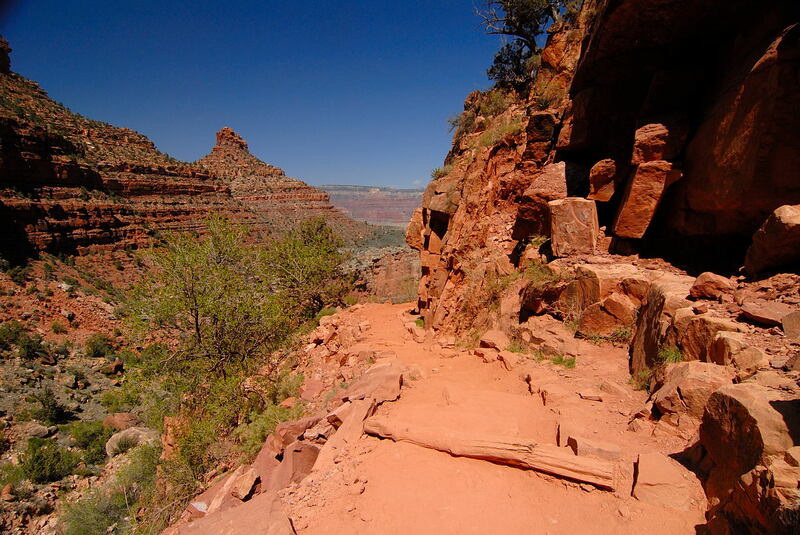 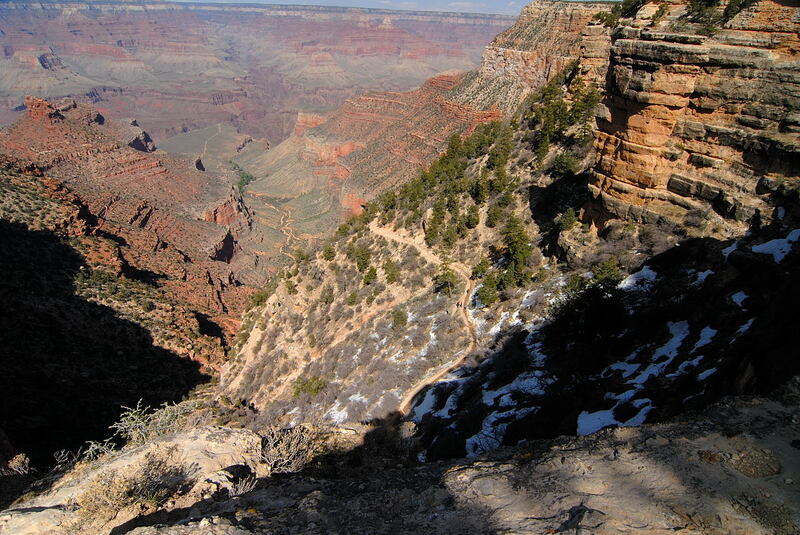 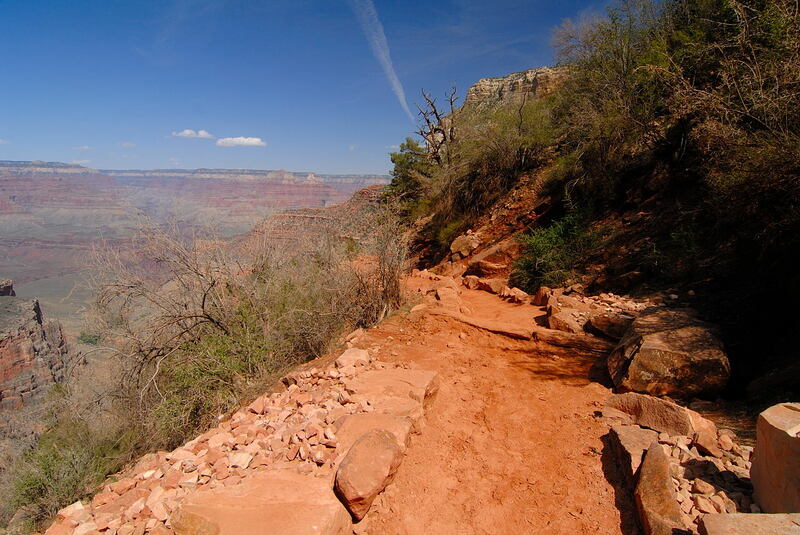 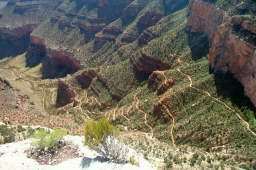 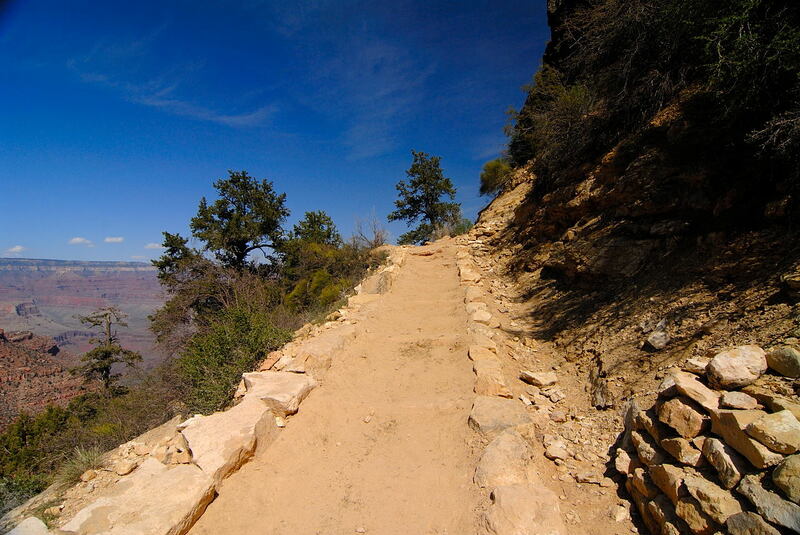 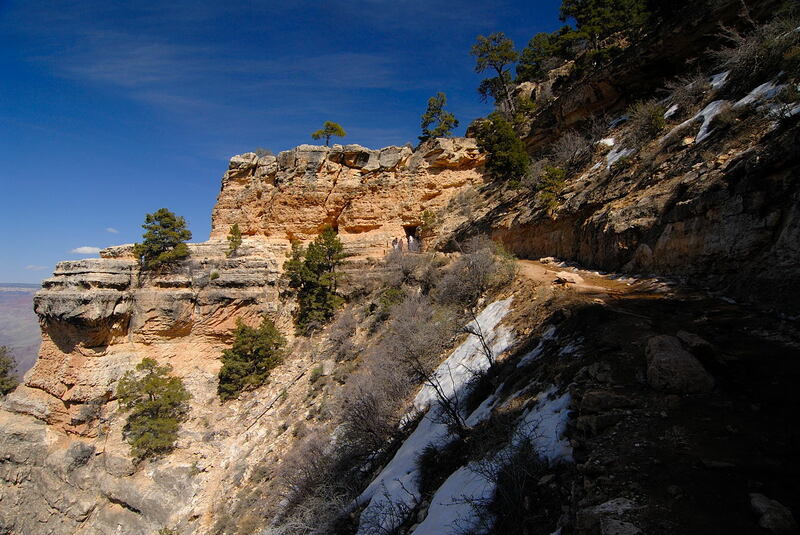 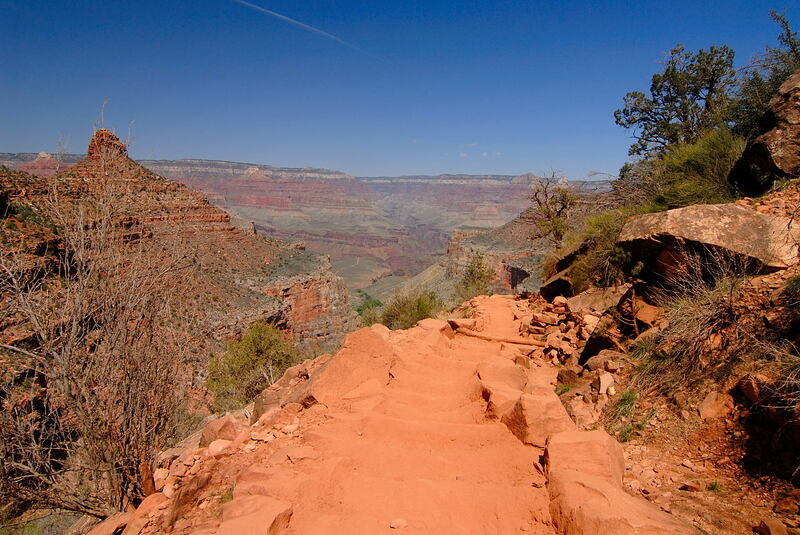 The steepest part of the Bright Angel Trail is at hand. 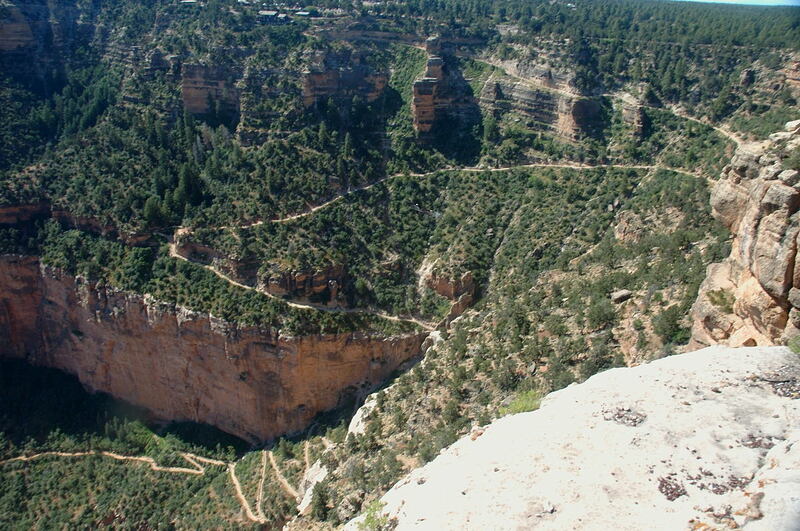 The cliffs and their height are certainly intimidating. The first time I encountered this section I joked that if I didn't know better, I would turn back immediately thinking there's no way any walkable trail could exist that could navigate up these walls. 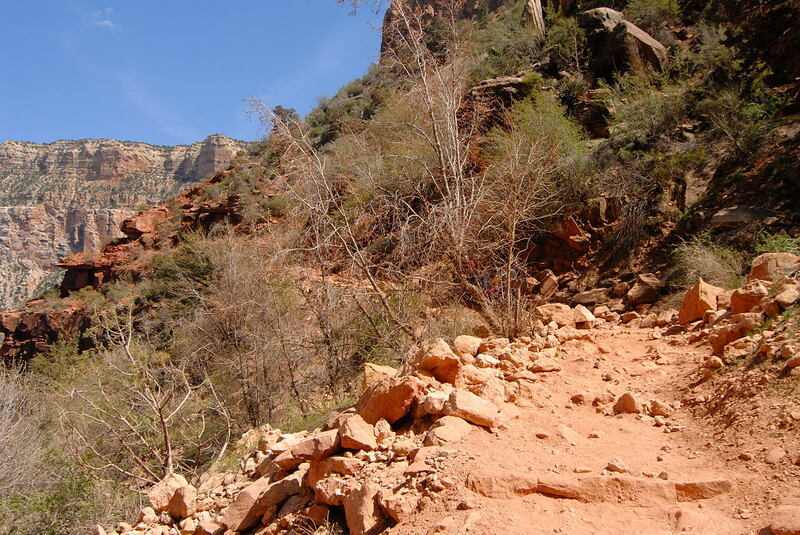 There were no signs of any trail even 300 feet ahead. 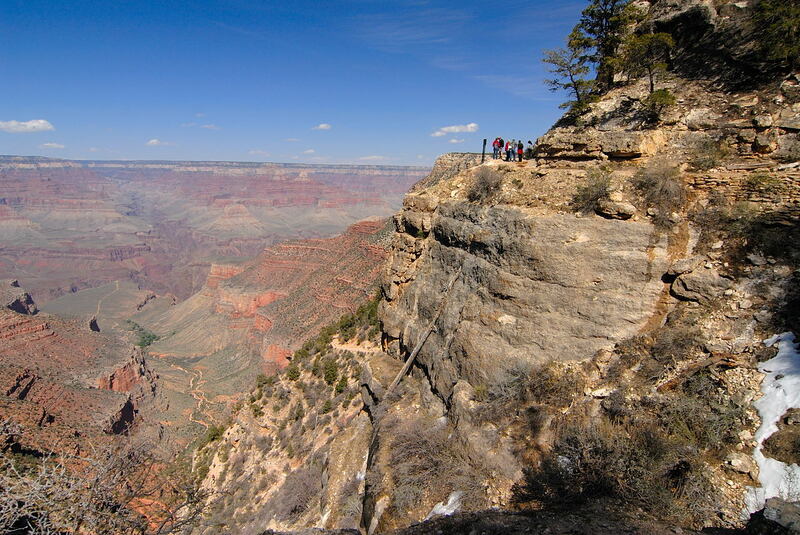 And yet there must be, all these people coming down didn't repel on ropes or jump! 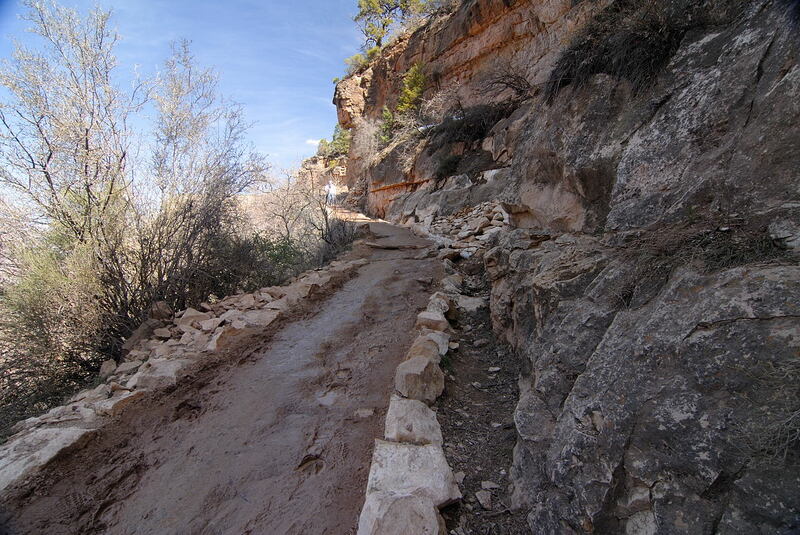 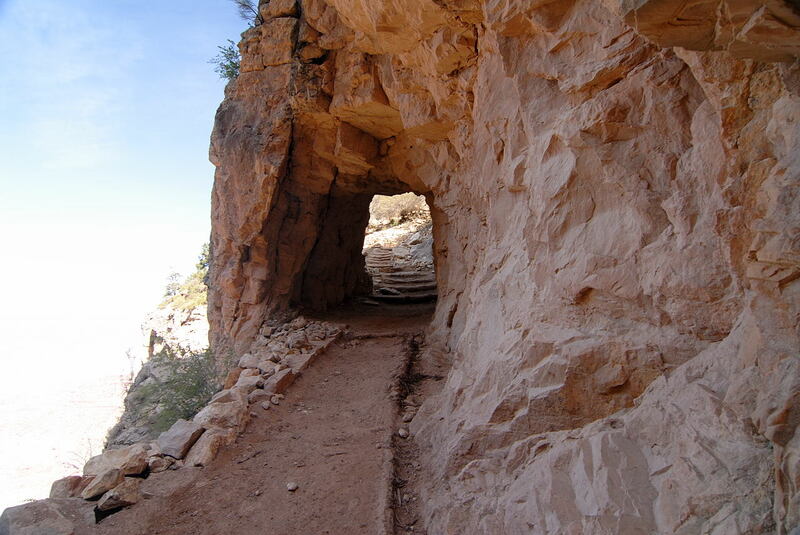 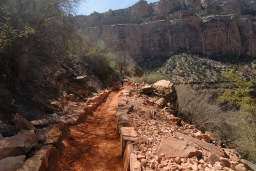 It is often difficult to know exactly where you are on this part of the Bright Angel Trail because there are very few landmarks of note. 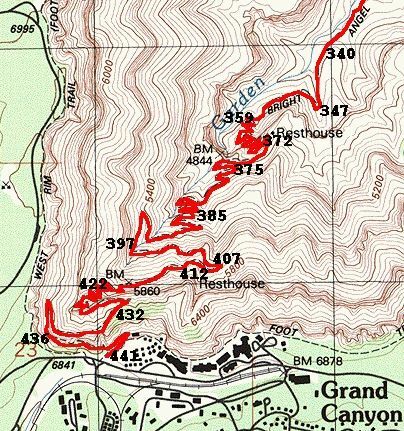 But there are two that are significant and by definition they tell you exactly where you are: the One and a Half Mile Resthouse and the Three Mile Resthouse (seen here in picture 175 at the left.) 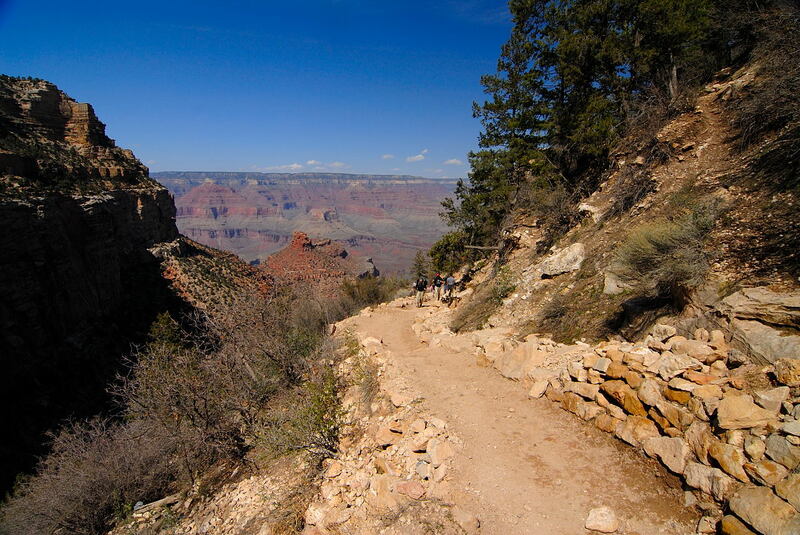 That means we have gone 13.7 miles and a very tough 3 miles left. 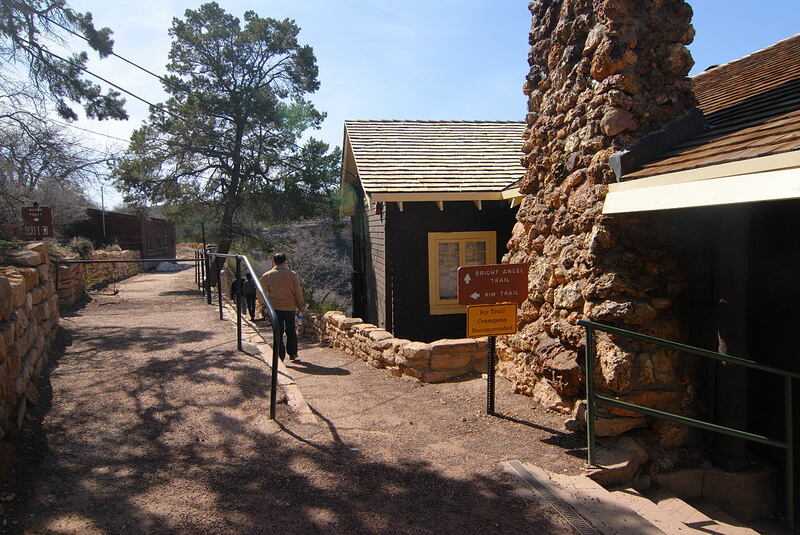 During the summer months (May-September) water is generally available at these two rest houses. 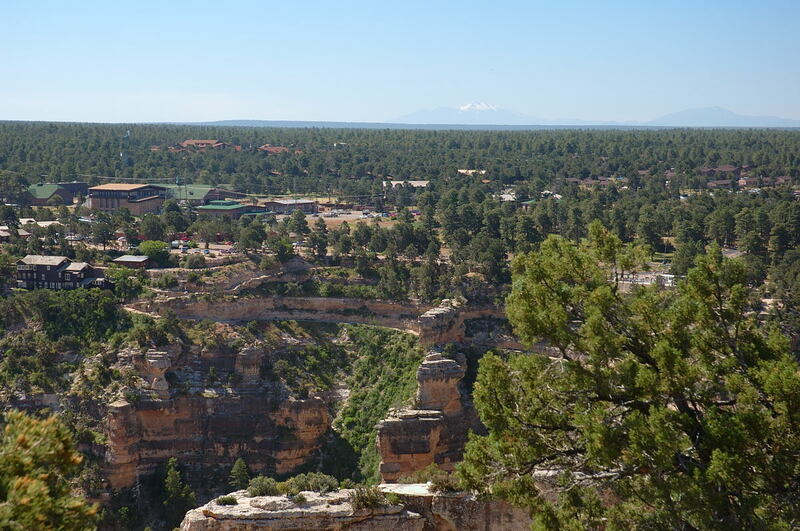 In the upper left of pictures 376 and 377 above is "The Battleship." 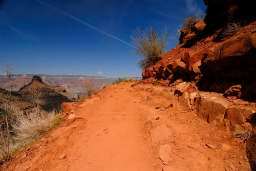 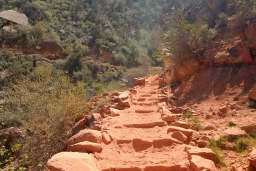 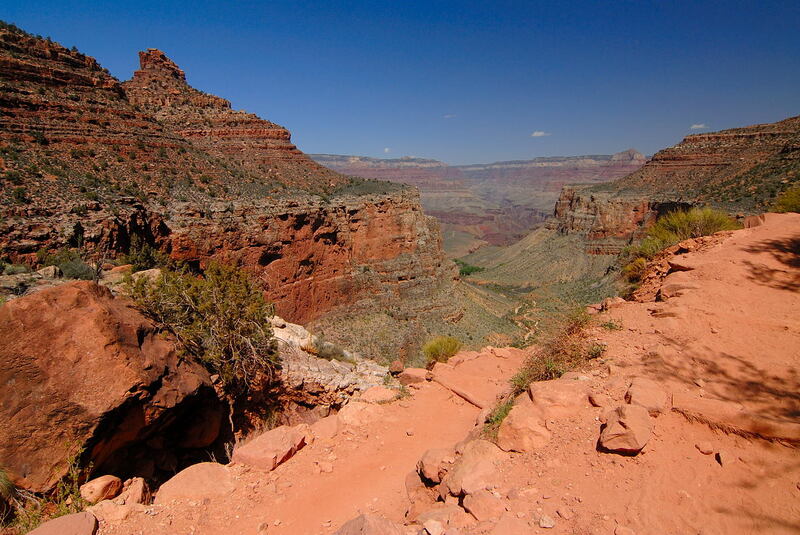 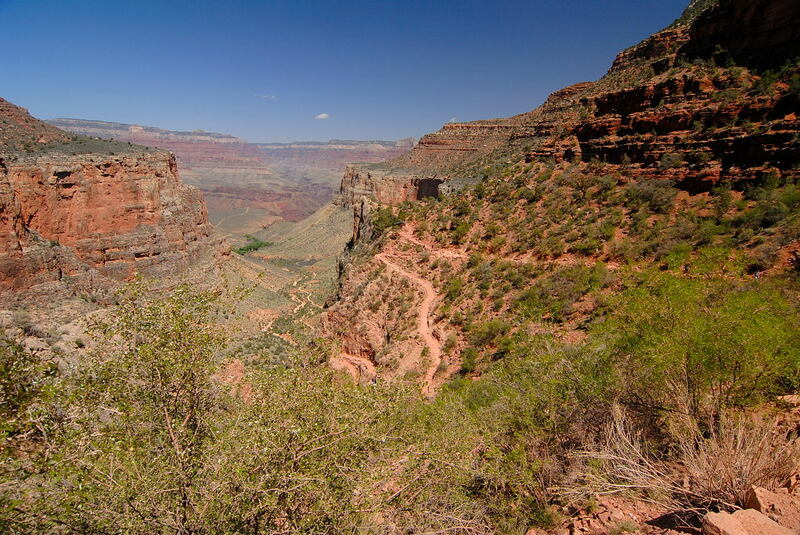 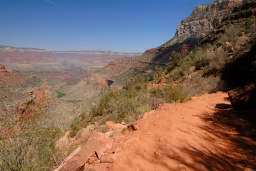 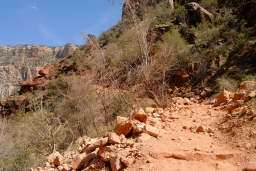 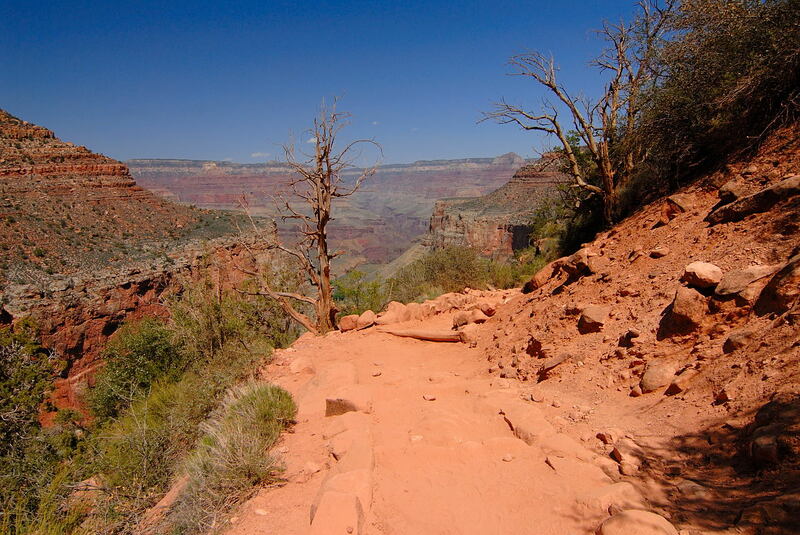 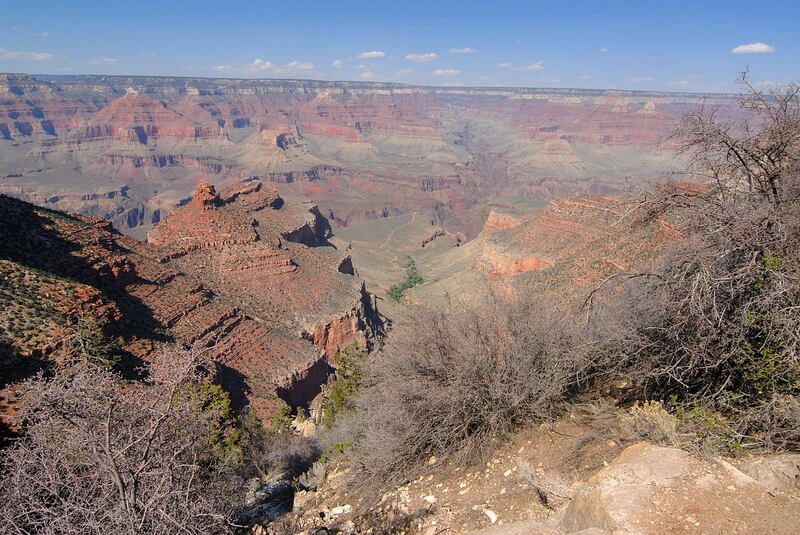 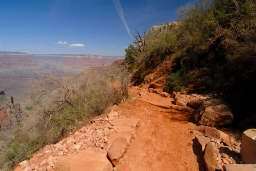 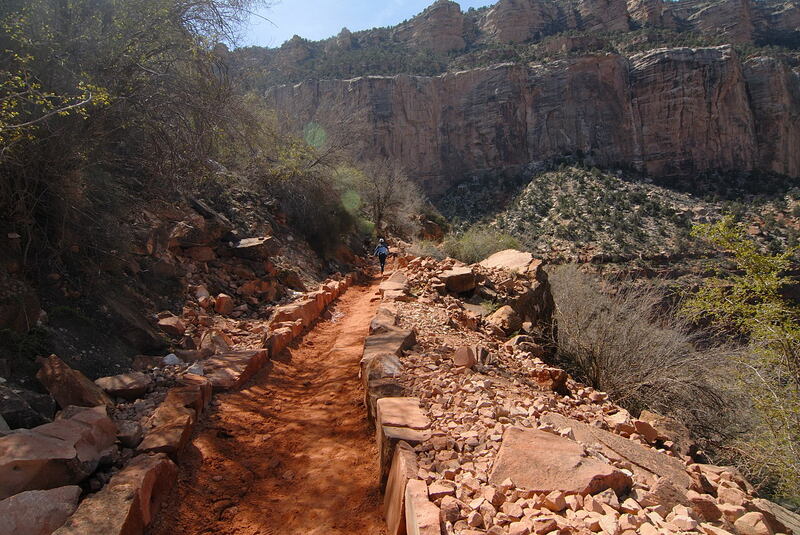 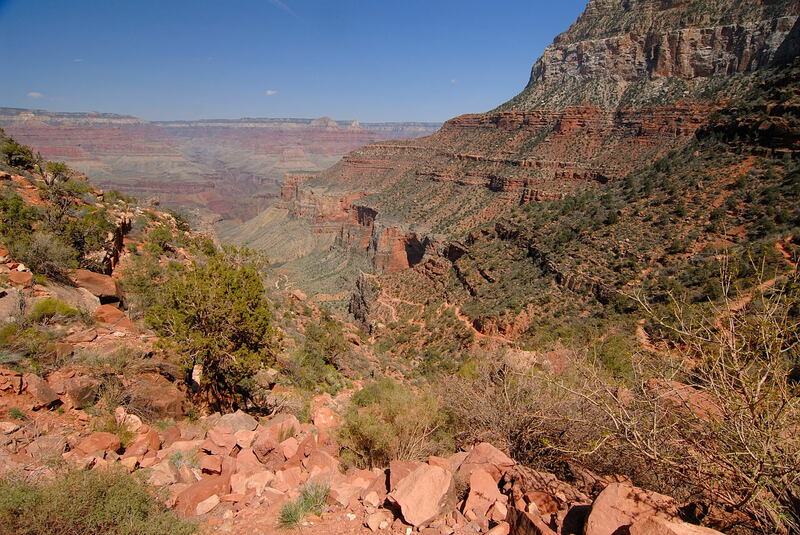 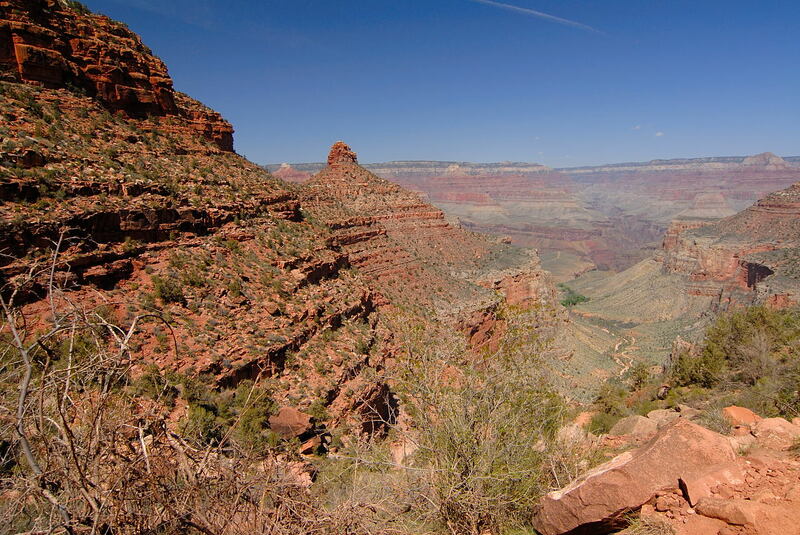 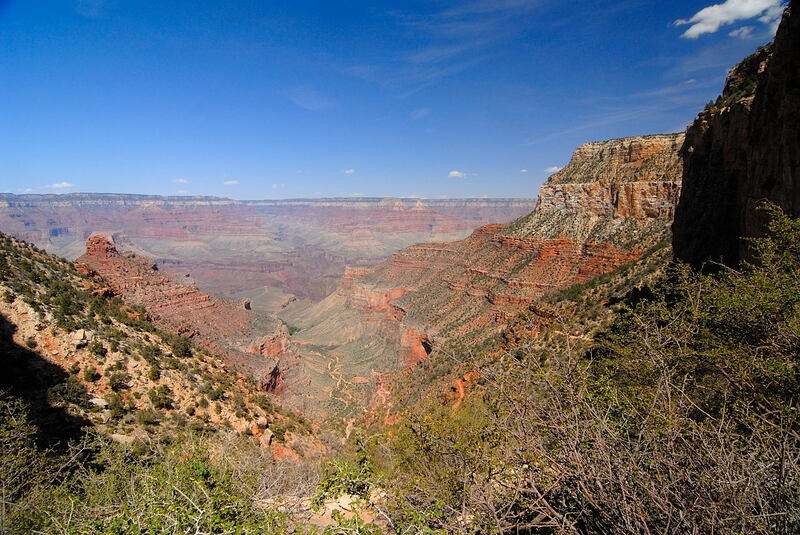 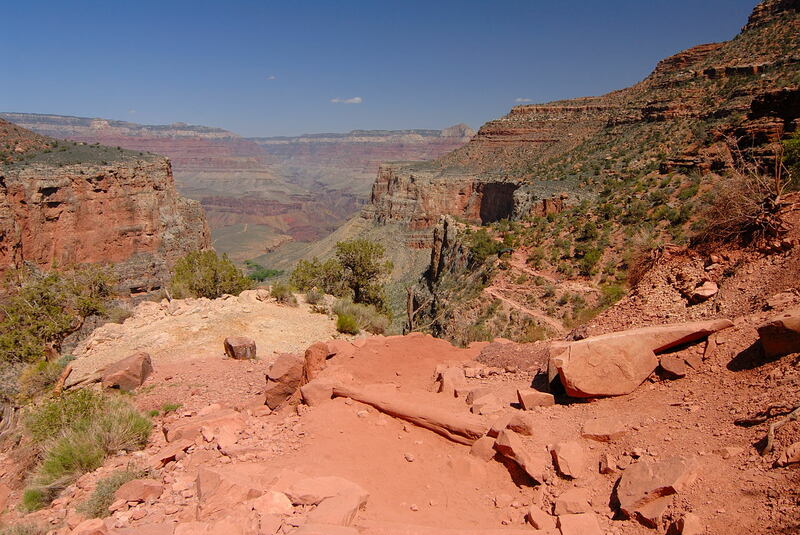 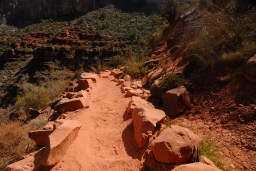 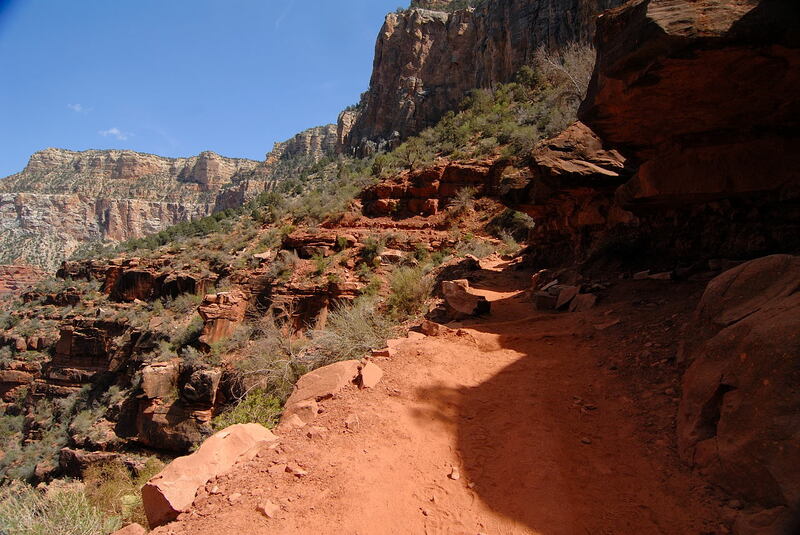 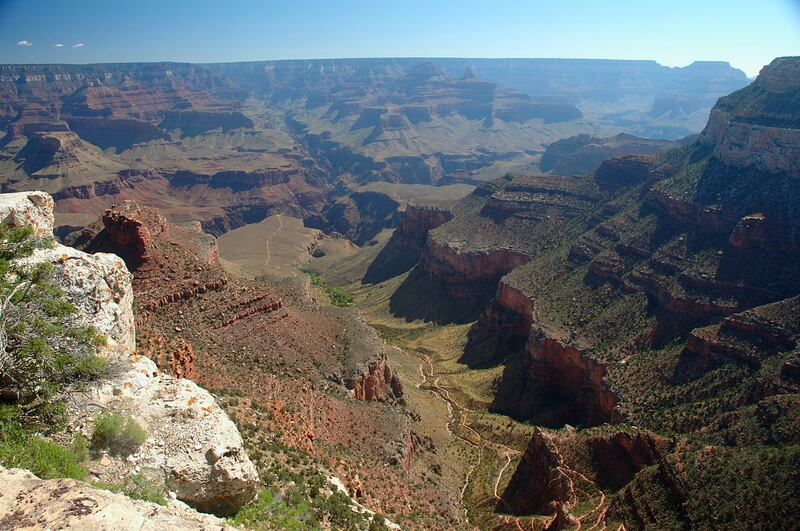 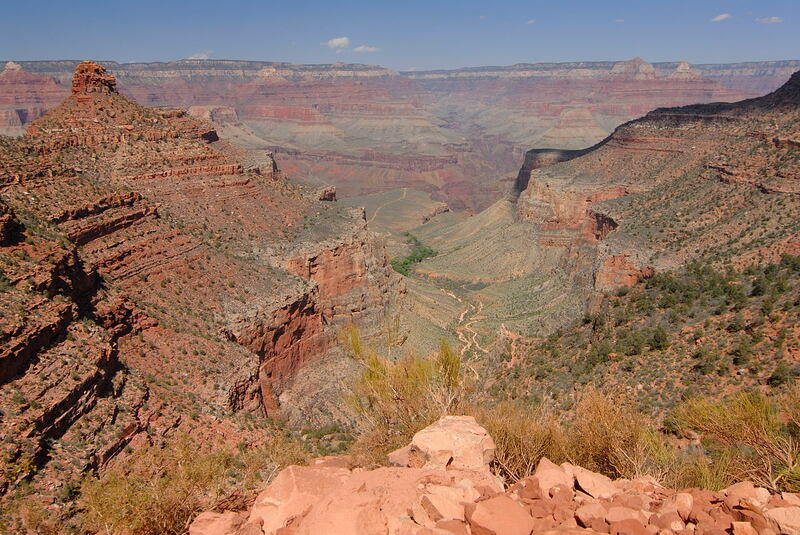 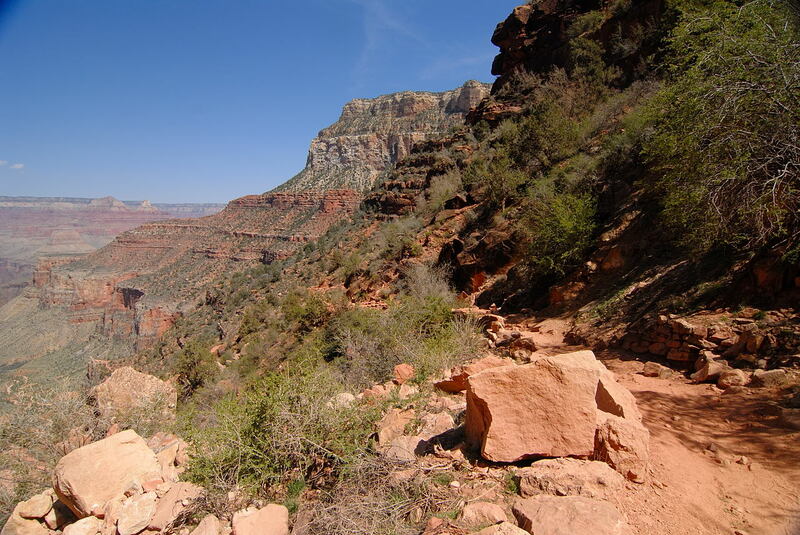 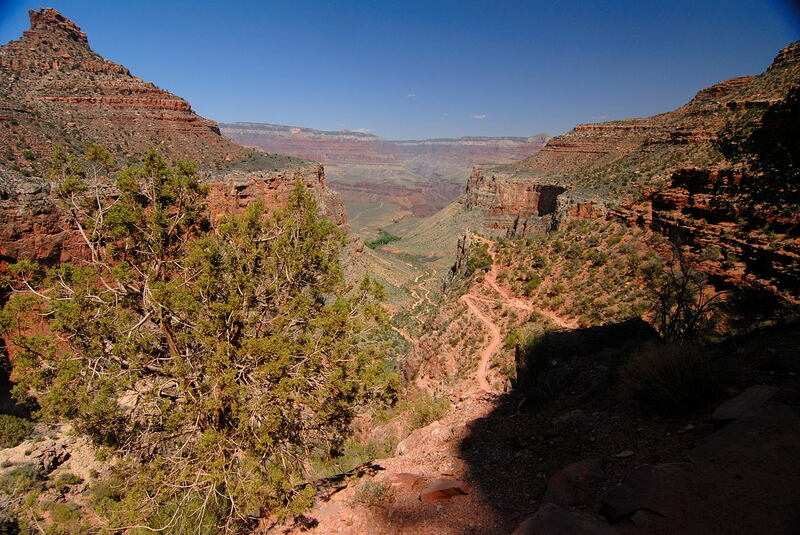 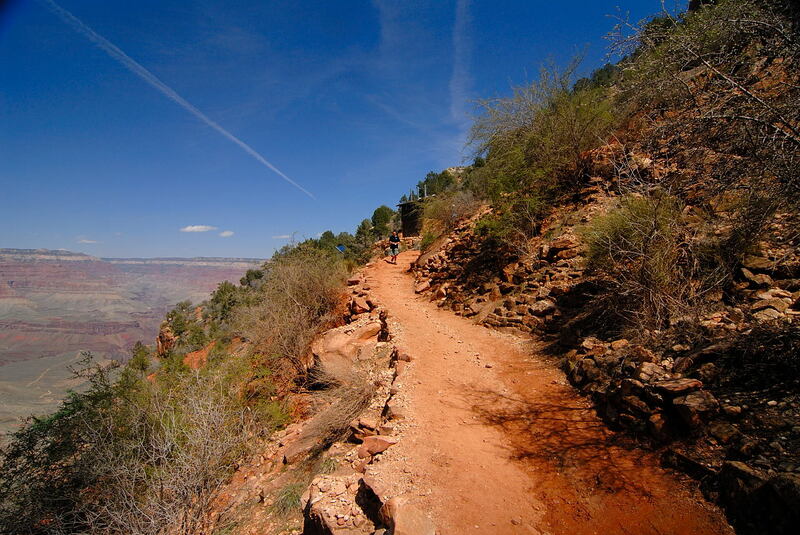 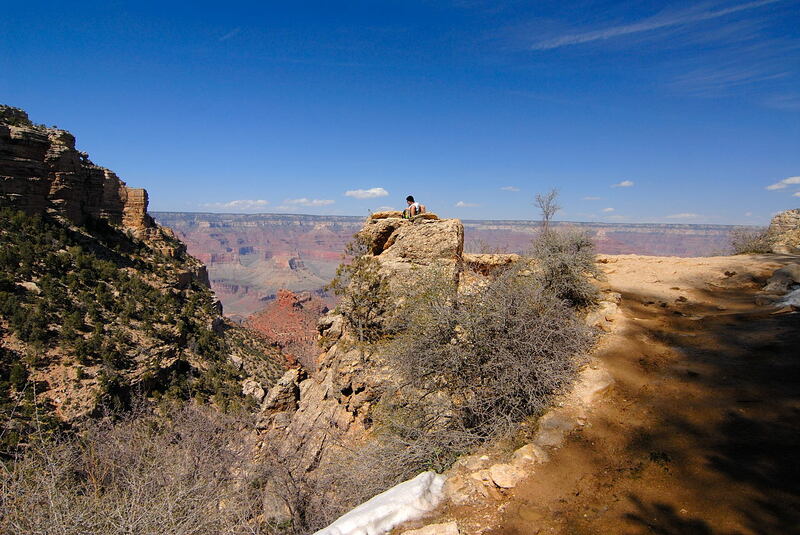 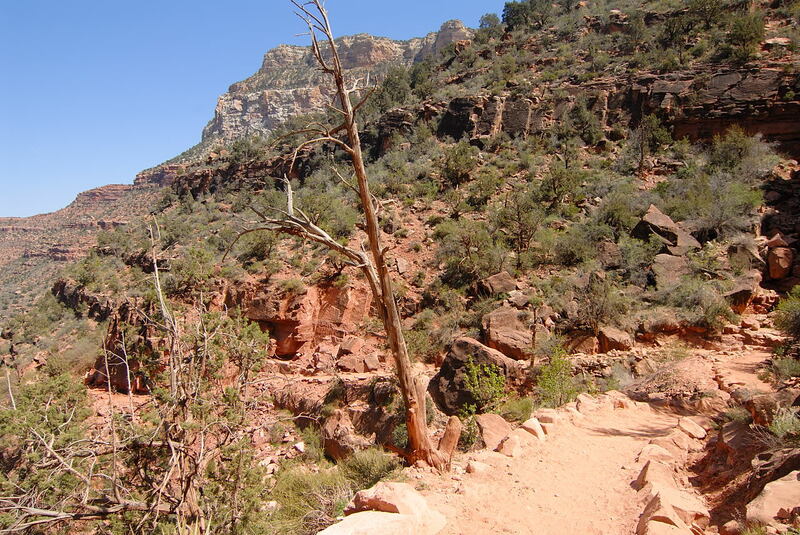 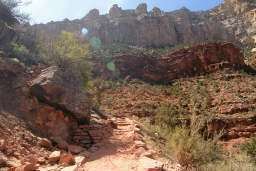 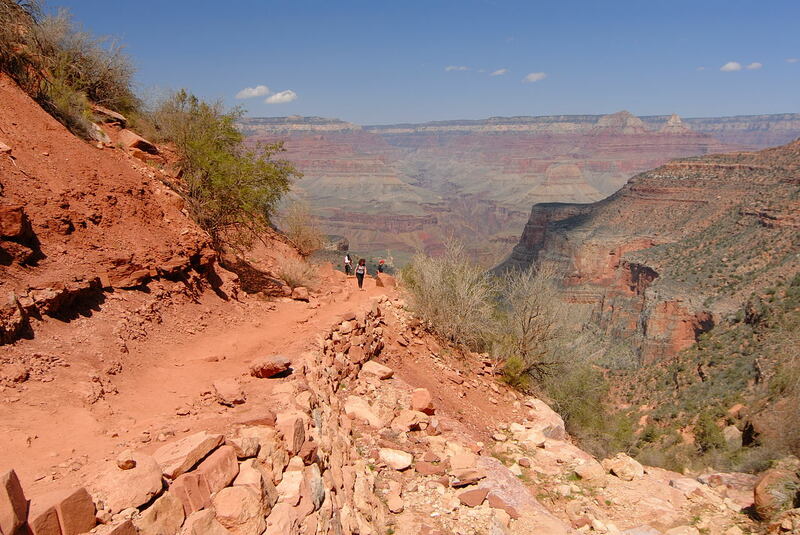 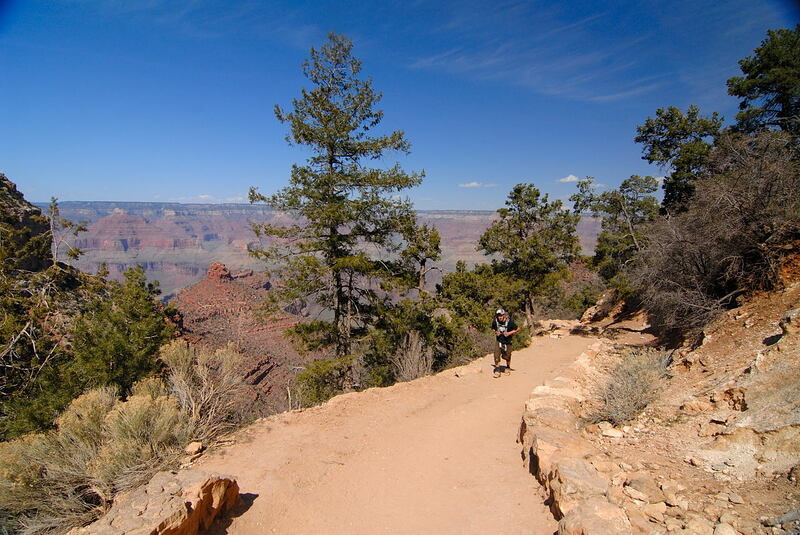 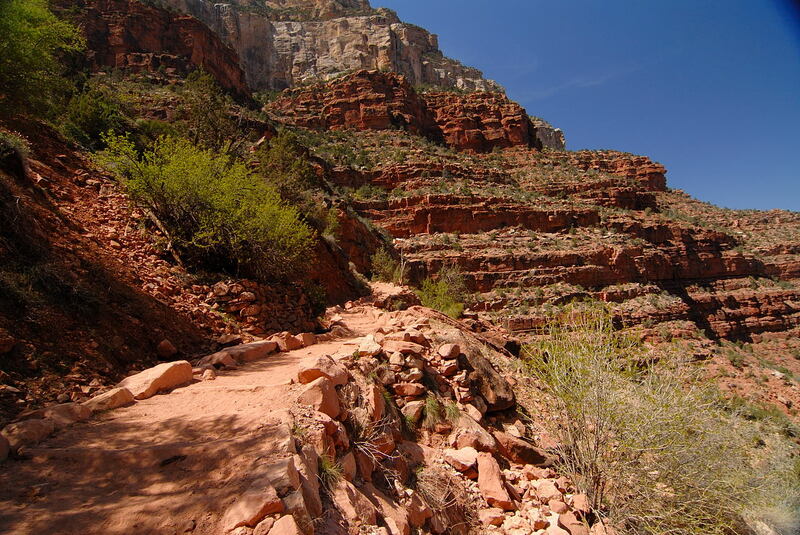 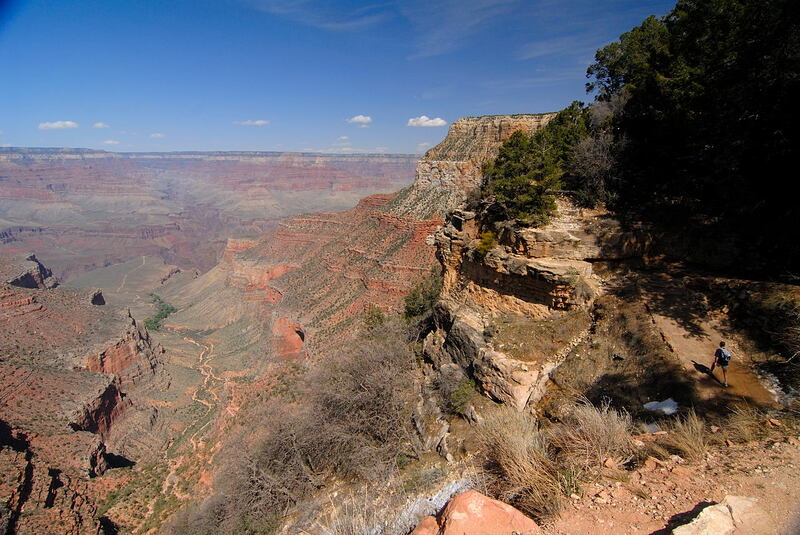 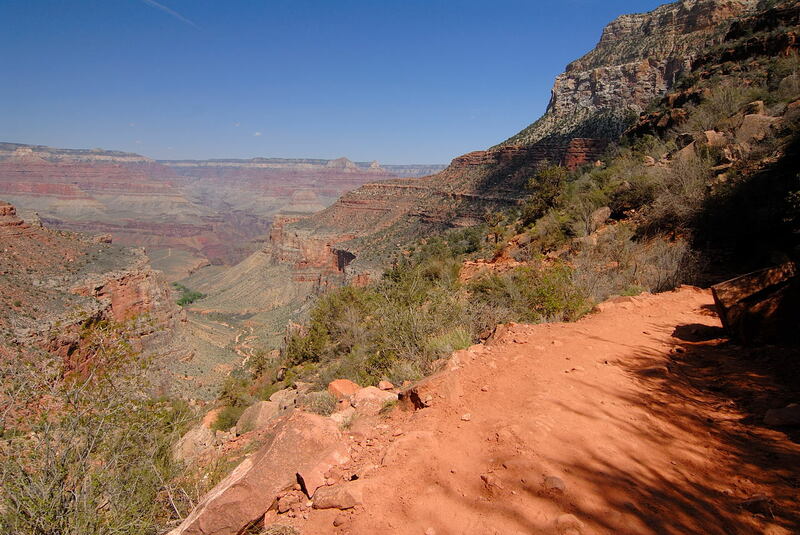 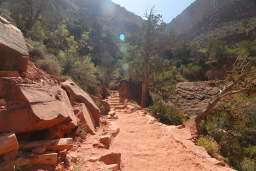 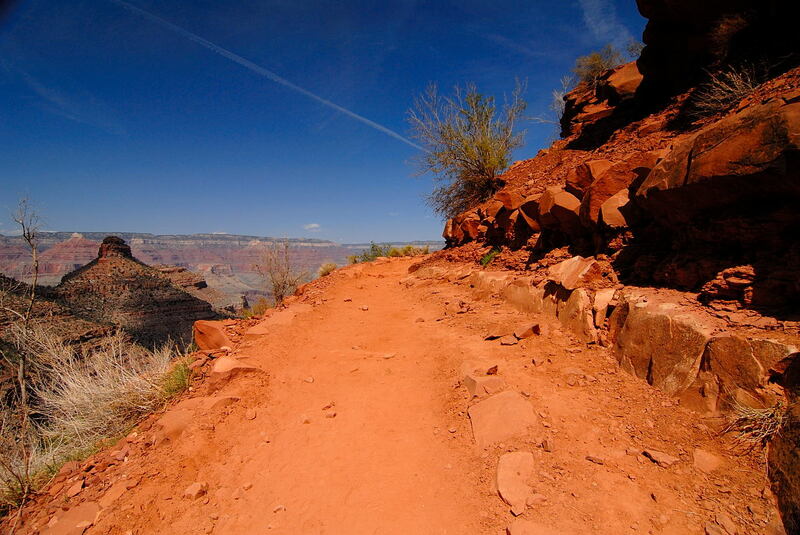 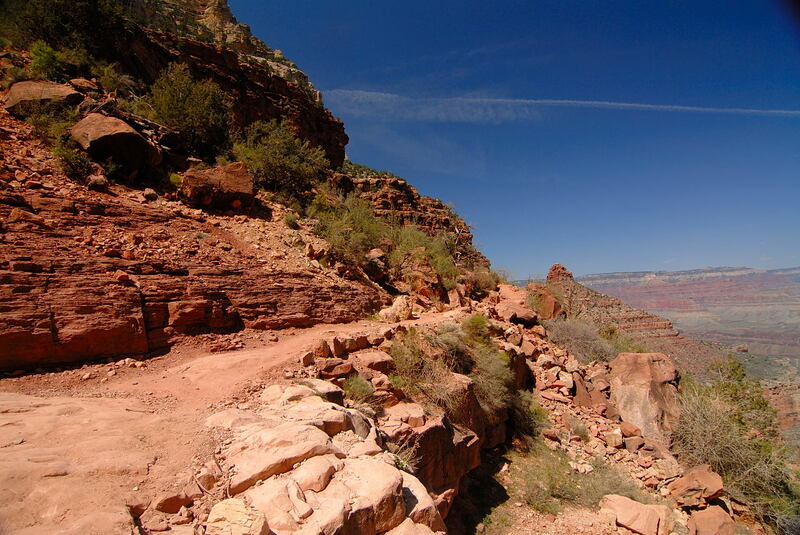 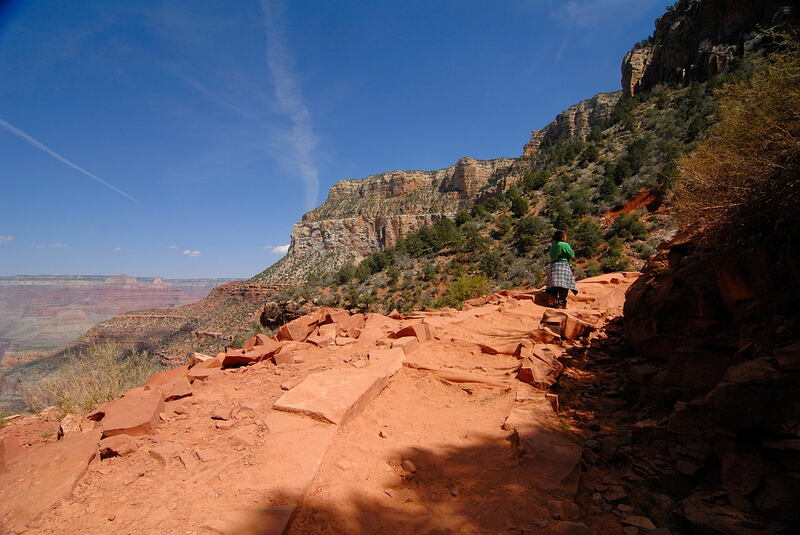 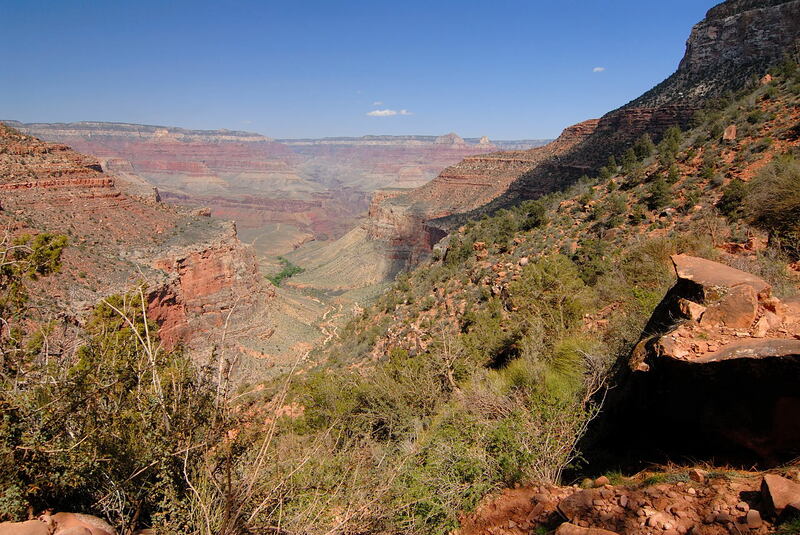 When I think of the South Kaibab Trail, I think of O'Neill Butte. 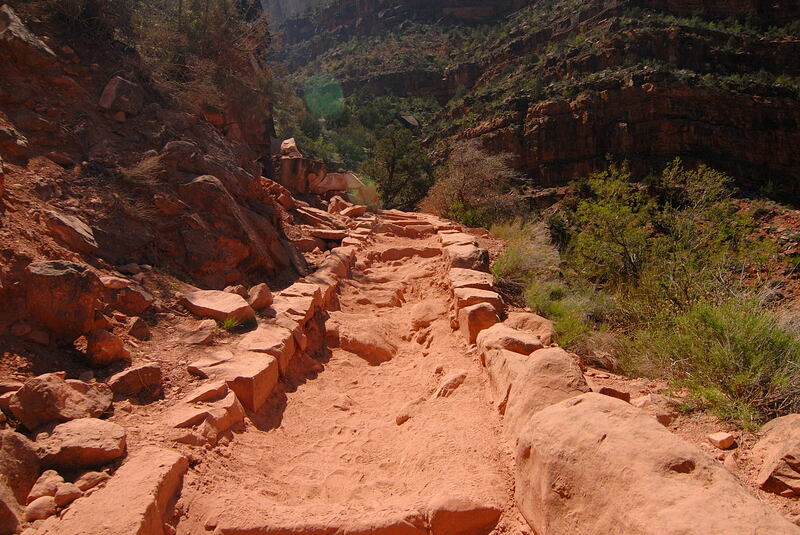 The Battleship is the equivalent feature here on the Bright Angel. 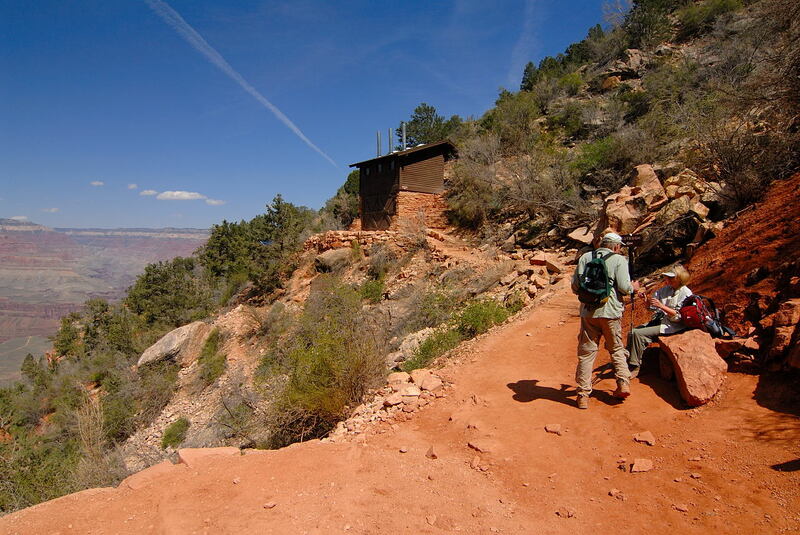 Your muscles are aching as you've finally arrived at the One and a Half Mile Resthouse. You will find yourself cursing the name of this place wishing it were called the Quarter Mile Resthouse. If you've come all the way from the river, you will now hope that the end is just around the next switchback. 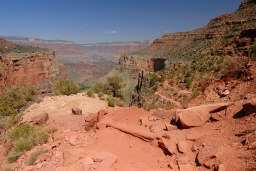 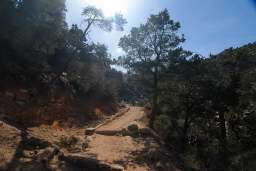 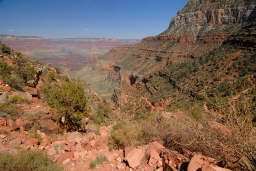 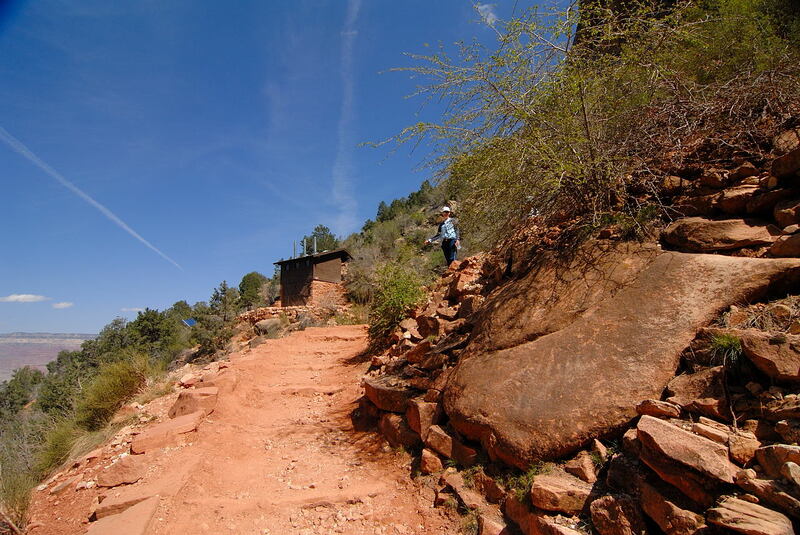 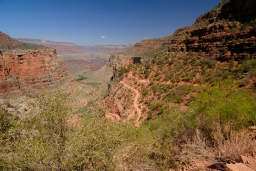 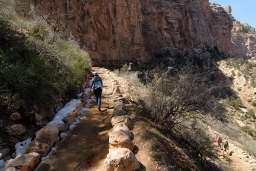 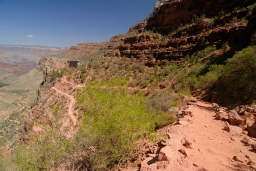 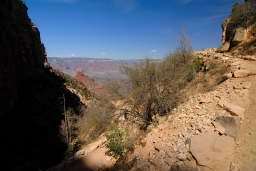 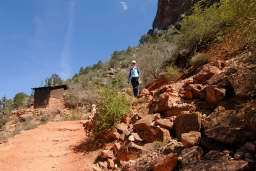 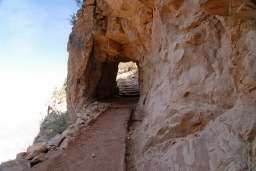 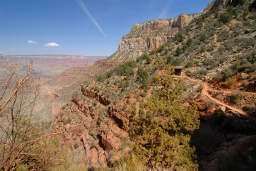 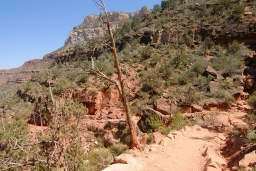 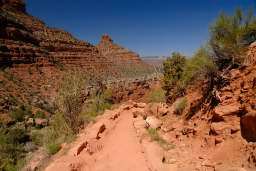 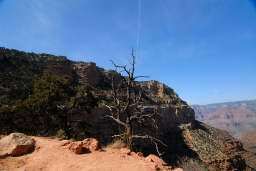 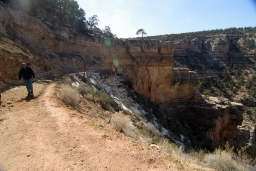 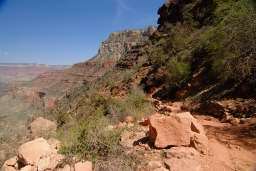 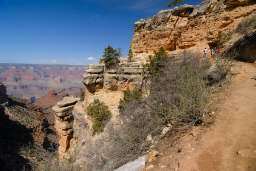 On previous hikes, Cindy would be waiting for me at the top of the Bright Angel Trail and we'd communicate with a pair of walkie talkies which would start working around the 3-Mile Resthouse. 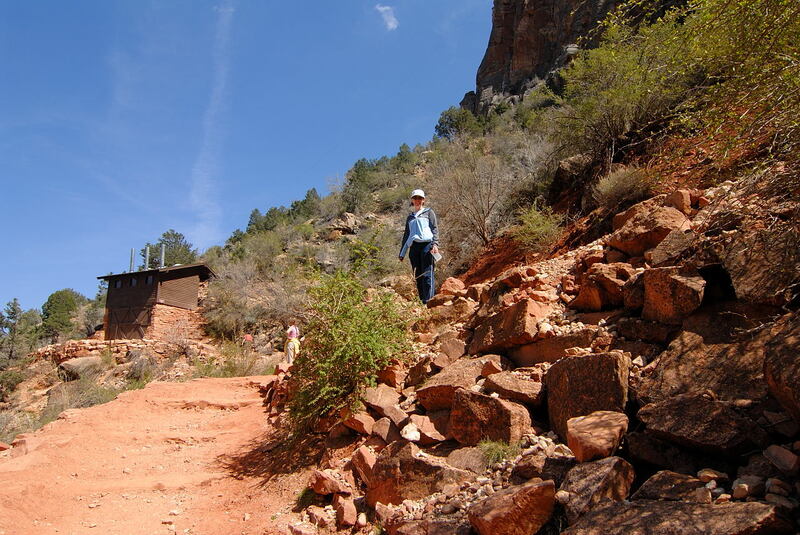 But on this hike we relied on cell phones which did not work as well as the walkie talkie's! 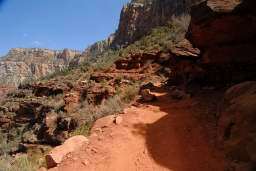 Enumerable attempts at phoning each other failed. We did finally connect - when I was about 2 minutes away!! So there's Cindy in the picture at the left. 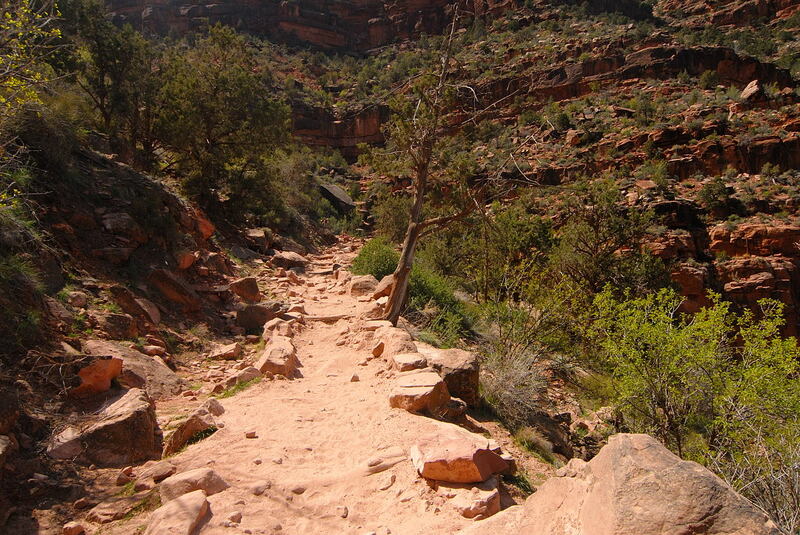 I arrived at almost exactly my plan: 5 hours into the hike. 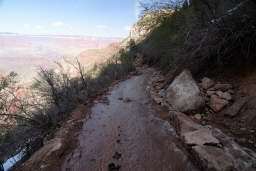 Cindy's big complaint was about the condition of the trail, indicating she had a lot of trouble with her footing because of ice and snow. 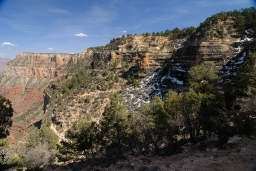 Ice and snow? 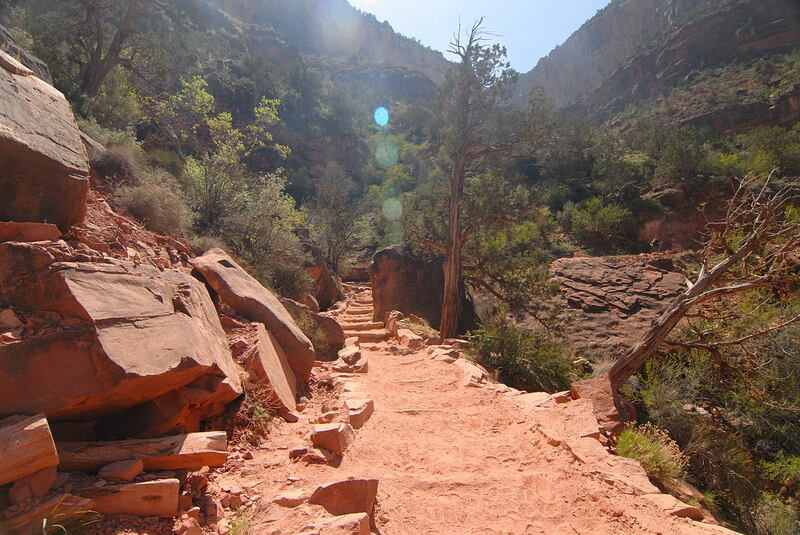 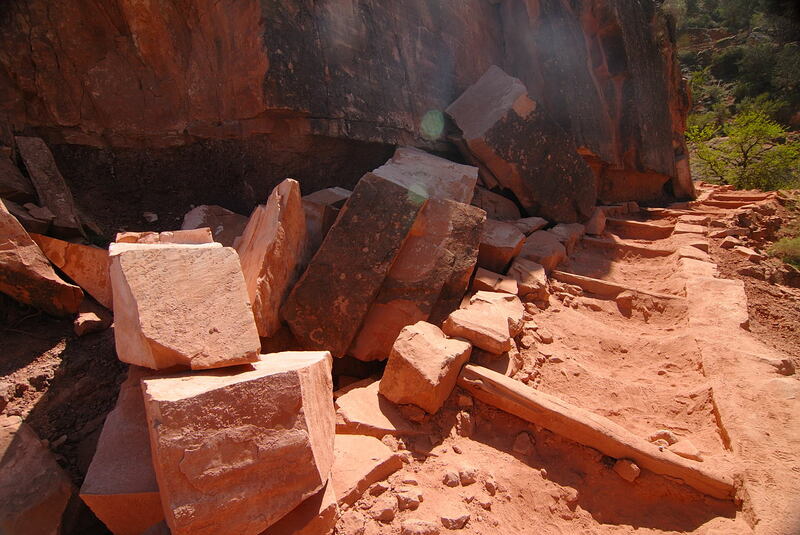 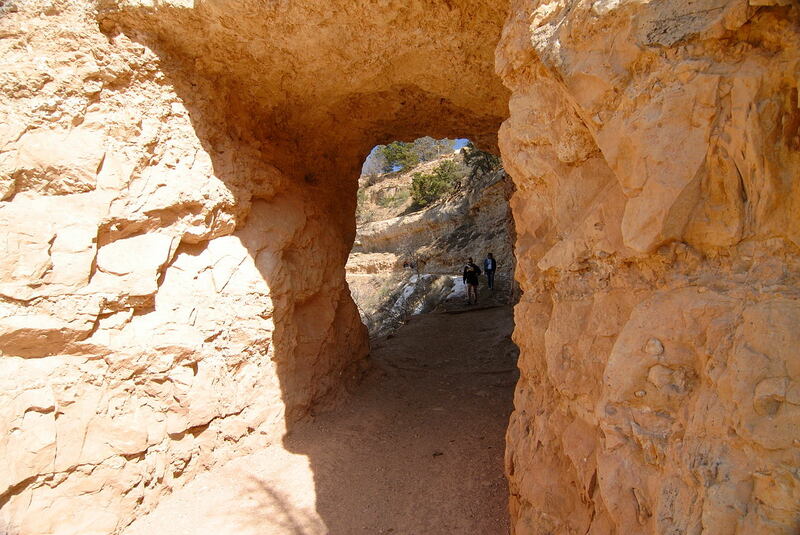 There was none of that on the South Kaibab, but that trail is very exposed so it gets a lot of sunlight. The top of the Bright Angel gets much less and some sections get almost no sun so it can take a while for the winter to ware off. I very quickly saw what Cindy was talking about. 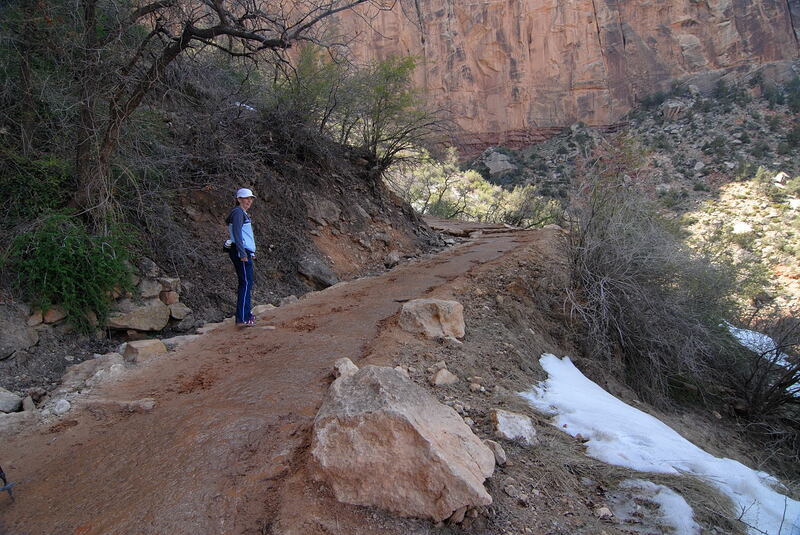 The shaded areas of the trail were either muddy, snow covered, or icy, and every combination of those three. You really never want to walk through mud as it accumulates on your shoes, adding weight to every step. 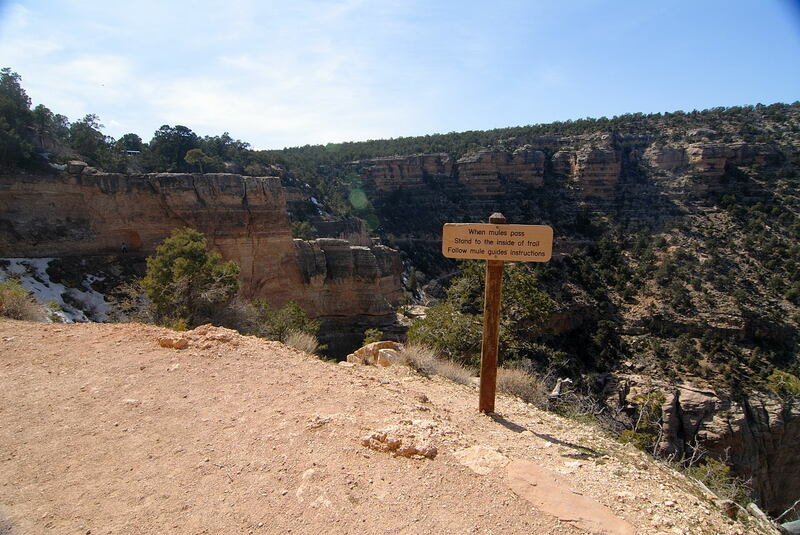 This is especially true when you've already gone over 15 miles! How am I looking? 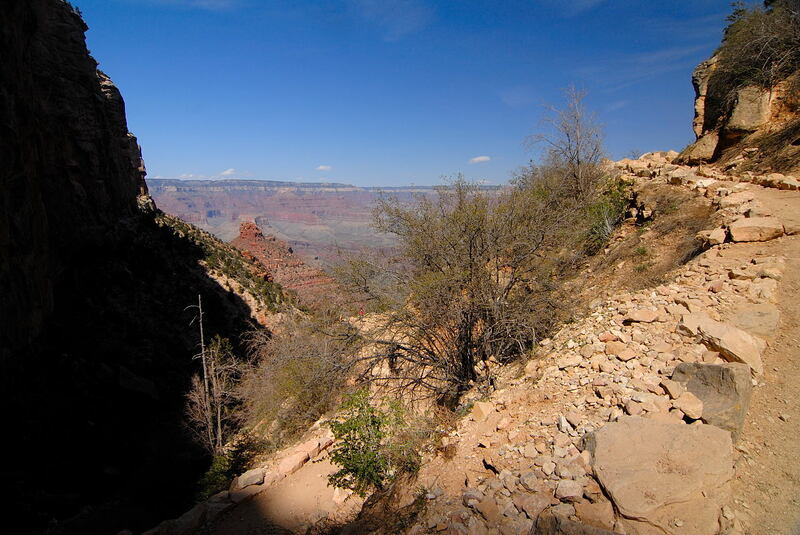 I've hiked over 16 miles at this point, but I'm as good as the top of the trail because I've hiked this path many times before and now the end is just ahead. 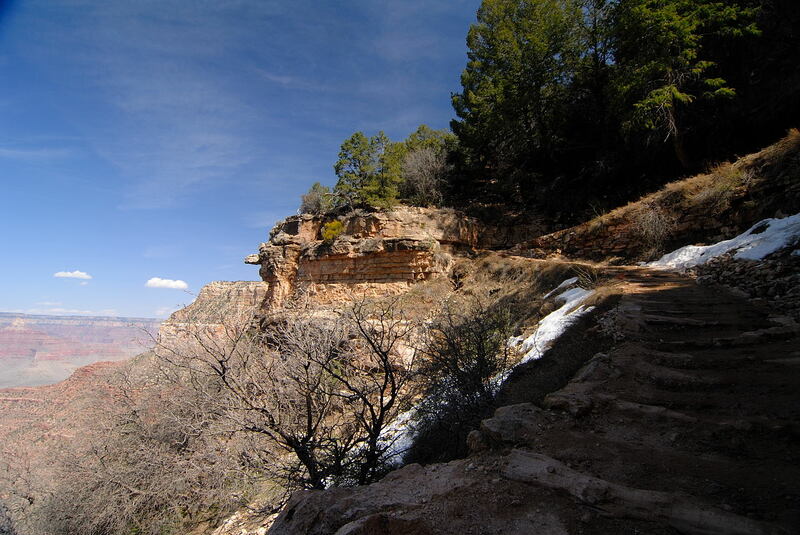 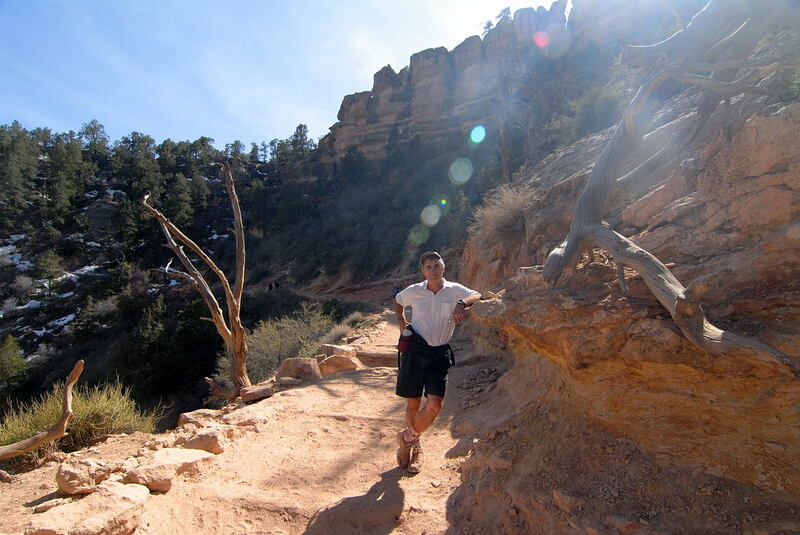 I arrived at the top of the Bright Angel Trail at 2:50, right on schedule. 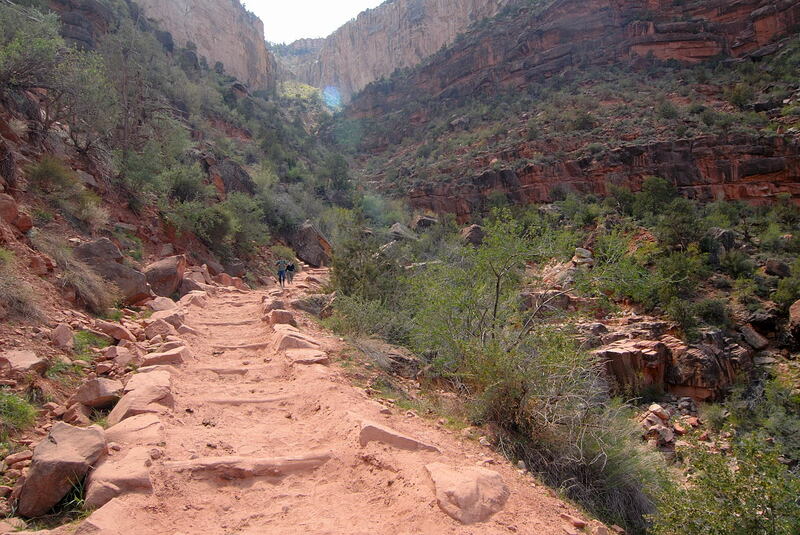 I was tired, glad the hike was now over, but far from exhausted. 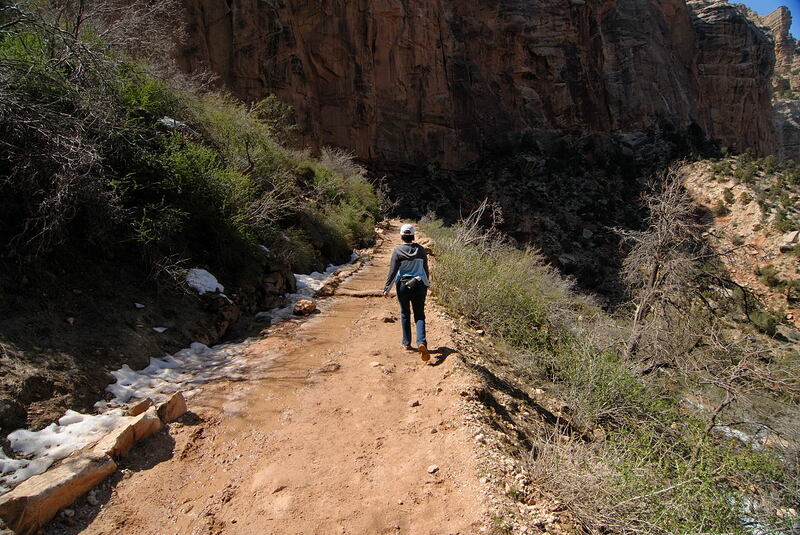 Every time I've done one of these day hikes to the river and back I wonder if it's my last. 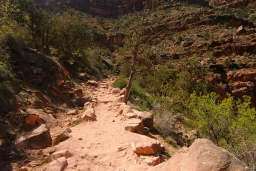 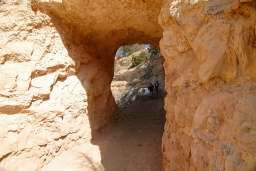 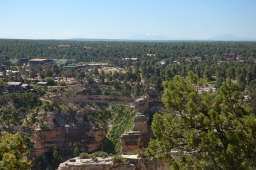 The physical demands are so great, I train a minimum of three months in mountains and heat of Phoenix where the conditions very closely resemble those at the canyon. In order to feel I'm ready for the canyon, I must do laps that total at least 4800 vertical feet on over 12 miles of trails. 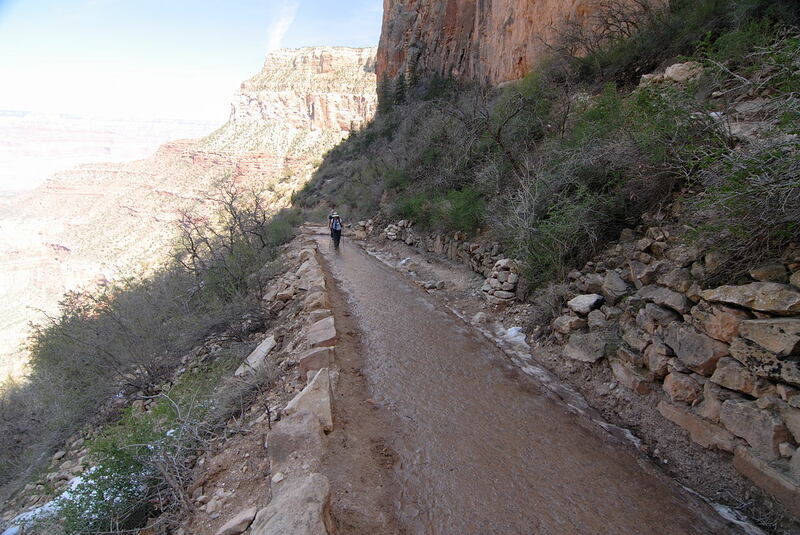 Even with this training, twice I've been totally drained dragging myself out of the canyon. 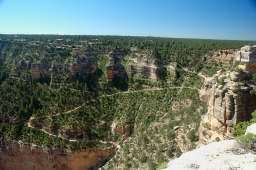 Yes, you can never take this endeavor lightly. From the top of the Bright Angel Trail which is right next to the Kolbe Studio, there is very little of the trail you can actually view. 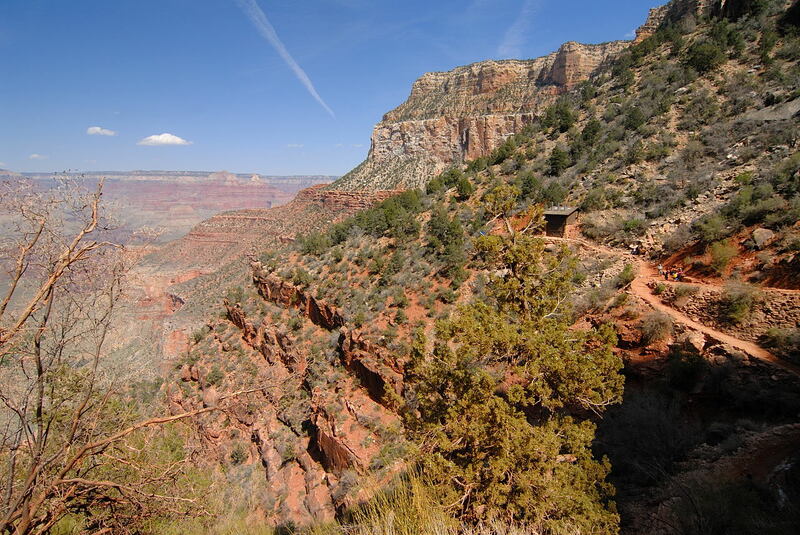 For that, the very first stop on the Hermit's Rest Route is Trailview Overlook and as you can see from the photographs, it is aptly named. 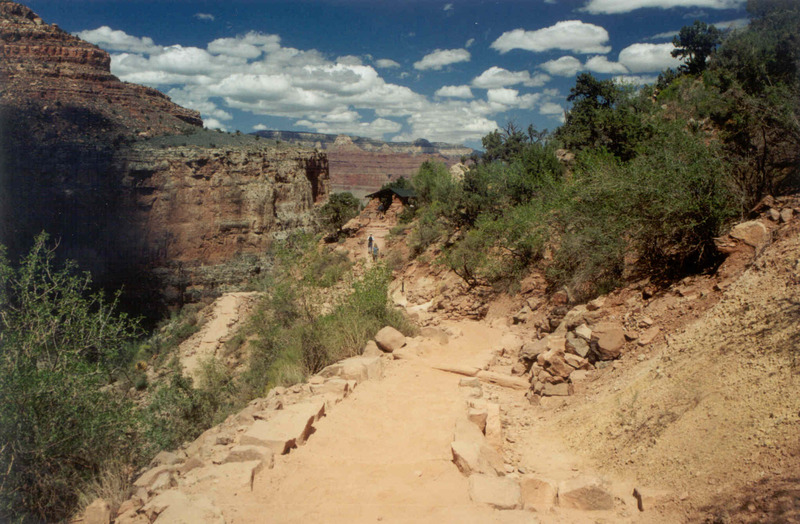 Much of the trail from Indian Garden all the way to the finish at Kolbe Studio is visible from this point.